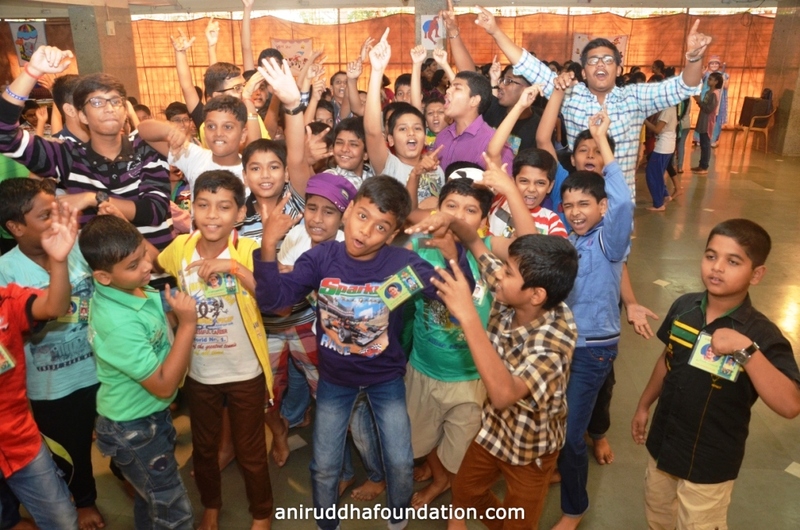 “Dhangad Dhinga” is a program that is organized for children of age 9 to 12 years by Shree Sai Samarth Vidnyan Prabodhini in association with Shree Aniruddha Upasana Foundation. Both boys and girls participate in this 10-15 day camp. It is an innovative initiative launched under the guidance of Sadguru Aniruddha Bapu and run by Nandai to develop the hidden qualities in the children and enhance their confidence. The word “Dhangad-Dhinga” implies various acts, games etc. where children can express their joy freely without any hindrance. The first “Dhangadhinga” Camp was organized in the year 1998 to make this concept a reality.Since then, every year this Camp is held around in the month of May for about 15 days. Announcement for this Camp is made at Shri harigurugram and at all other Upasana Centres, following which children are selected for the same. 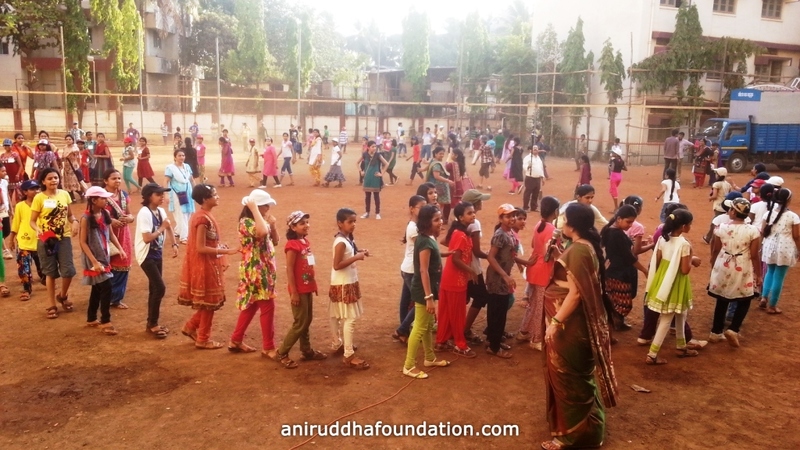 More than 2000 children have benefited from this Camp in the last seventeen years. Everybody is blessed with a gift of some latent qualities by birth. It is imperative to develop these qualities during the childhood itself. In the daily schedules of children school, coaching and other classes along with studies assume so much importance that their hidden potentials do not get the opportunity to be expressed and hence hidden skills can not appear forth. It is important to know and make efforts to develop children’s inherent qualities. Children are losing their “childhood”. Hence the objective of this initiative is to achieve proper development of children. On this background, Dhangad-Dhinga Camp is a initiative that gives back the lost childhood of the children. All activities in this program enhance their confidence by sketching their personalities. 1) A prayer is held every day at the starting and end of the day of the Camp to inculcate devotion at a young age. Thus, chanting Gurukshetram Mantra, Hanuman Chalisa Stotra and the Hanumat Kavach become a habitual permanent part of their routine. 2) Children play various sports at the Camp like outdoor, indoor, memory enhancing games etc. Various craft items based on skills are taught to make to increase concentration of children. To inculcate healthy eating habits, healthy, nutritious yet tasty food is given to all. Children are asked to make different items from paper pulp. The children enjoy it a lot. Happily, they dry up the things, paint them and enjoy their own art work. An exhibition of those things is held on the last day of the camp which is called as the ‘Hobby Day’. A One Day Trip for the campers is also organized! This trip offers the children a treasure of enjoyment. Parents and children always wait for such a enjoyment-filled well organized camp. Parents are always await this opportunity for their daughters and sons. The beautiful changes that happen in their children every day surprise the parents and through letters, e-mails and actual visits they describe these changes in their children. They are happy, they become speechless and feel “Ambadnya”. Indeed, this initiative under guidance of Bapu and managed by Nandai builds self-discipline in every child. The children, who drench in divine love, are the true pillars of the nation’s future. Certainly they will brighten the image of our nation! William Wordsworth has said “Child is the father of man”. These children are going to make this sentence to be true.